This is our first year growing this herb, an aromatic Mexican native for tacos, salsas and sauces. 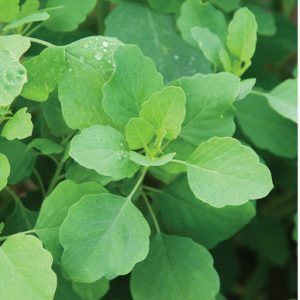 It has large, bluish green leaves with a flavor reminiscent of cilantro and arugula and is popular in Hispanic communities where it is used like cilantro. Traditionally the leaves and flowers have been used medicinally in Mexico, Central and South America to treat high blood pressure, infections, stomach and liver disorders. For more information on papalo, check out this great article. Crush the onions, the chilis, the salt, the lime juice, and the papalo in a mortar & pestle or a molcajete until they are paste-like. Add the avocado flesh and mash it roughly into the paste until well mixed. Stir in the tomatoes and then put the guacamole in a serving dish (or serve in the molcajete). Mix the tomatoes, onion, and shredded papalo that were reserved for the topping and pile it on the surface of the guacamole. Garnish with whole papalo leaves and serve. For more great recipes with papalo: Appalachian Feet.